Archetect's drawing of the original Burger Chef building with outdoor ordering area. Burger Chef's original building design is known as the 'kite look' or 'open kite' shown in the sketch above, designed by Indianapolis architect Harry E. Cooler. The roadside sign was developed in conjunction with the Grate Sign Company of Joilet, Illinois. As the sketch shows, the early stores had the ordering area outdoors. Early in the 1960's the BC 08 building was introduced with indoor ordering and dining areas with stools and two seat tables on either side of the serving area. In the mid 1960's the BC 08-16 building was introduced, similar to the BC 08 but had booths along the front wall. The exterior walls of these stores were clad with white porcelin enamel panels with red diamonds, this was reproduced in backlit plexiglass along the roof line. There are floor plans on this page. The kite look gave the Burger Chef stores a sense of excitement, with the upward and outward thrust of the reproduction of the road sign across the front of the building. This shape was also reproduced in the roof sign, which extended from the ordering area. the shapes along with the vibrant colors used added to the excitement. The kite look also gave Burger Chef some identity with this unique design. In 1968, Burger Chef revised the open kite building design with the introduction of the Cosmopolitan II style. The building front of the Cosmo II retained some of the open kite look with the front window frame, now framed in lava block, and roof sign. The facia lighting was yellow and had a muted diamond pattern. The rear half of this design had a four sided roof and a brick exterior. The roadside sign was also modified at this time, still an open kite design however with the neon and bulbs replaced with back light plexiglass and the Chef moved to the top center. The Cosmo II was considered a transition to more former building designs Burger Chef would later adopt. In the 1970's, roadside architecture became more subdued, using nature oriented colors instead of neon and bright colors. Burger Chef introduced a more formal looking building at this time called the W-II with brick exteriors, tan mansard roofs, wood beams and a more muted color scheme. Roadside chains began to loose thier identity because everyone was using the same colors on thier buildings, and designs looked similiar. Some stores that were originally open kite styled which were remoldeld with this new design had the open kite shape in the front window frame. By 1980, Burger Chef's architecture was very formal, with white shutters and pillars. This building design was called the W-III and looked almost like a house. 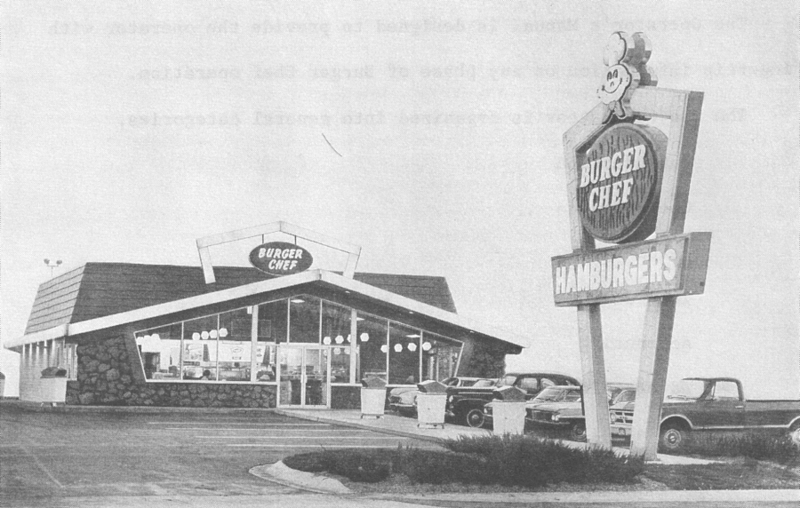 This building design helped with Burger Chef's efforts to become more 'homey'. This is an example how a company's building style can affect its image. The Burger Chef BC 08-16 Building Style, the classic "open-kite" look. 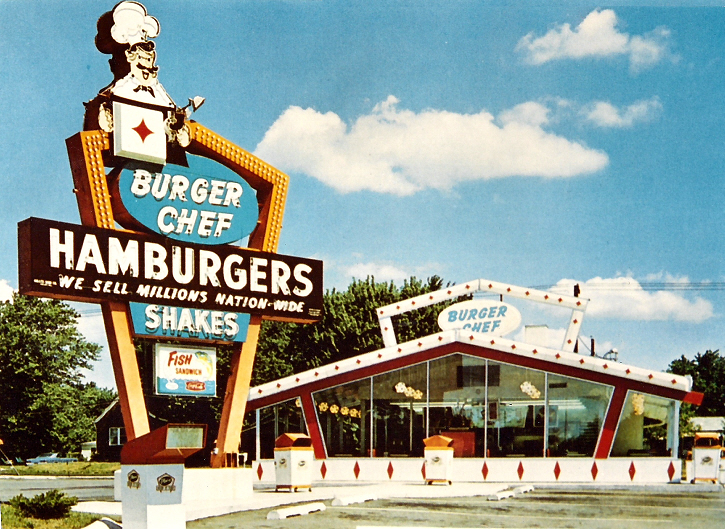 A Cosmopoliatin II Style Burger Chef Building with updated roadside sign. Building style used in the mid 1970s called the W-II building. Late 1970s Burger Chef building known as the W-III.